Edit: the tutorial is below! 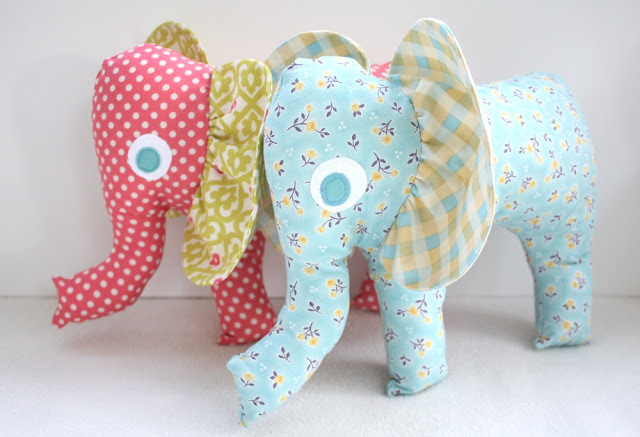 My girls have been loving on these little elephants and playing with their big floppy ears! The fabrics are from Riley Blake of course-the pink is Pink-Indian Summer, the green ears are Green Indian Summer Damask. On the blue elephant, the floral is Promenade in Blue, and the plaid is Promenade in, you guessed it-plaid. They have cute little appliqued eyes and the ears! I love those big ol’ ears. Too cute! Of course elephants have got to have tails! 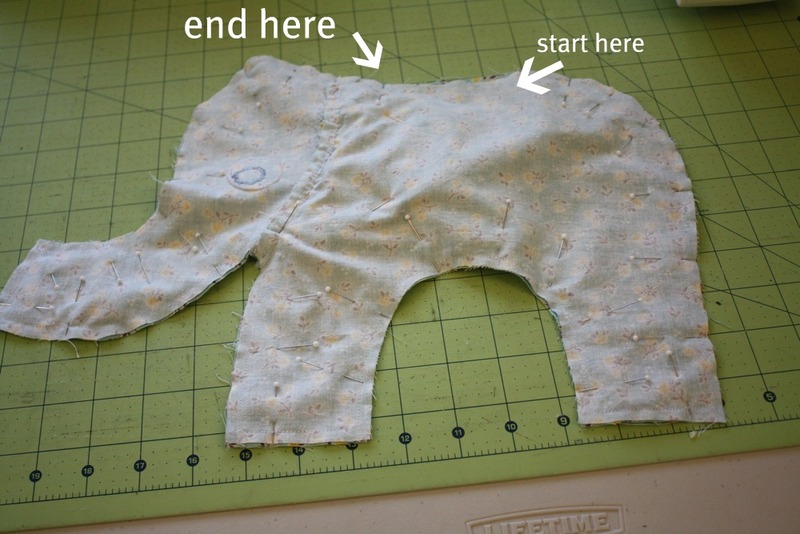 If you’d like a floppy eared elephant of your own, read on! First tape together the pattern, then cut out the pieces of your pattern as labeled. Cut all the pieces so that they are mirroring each other, ie right sides together. 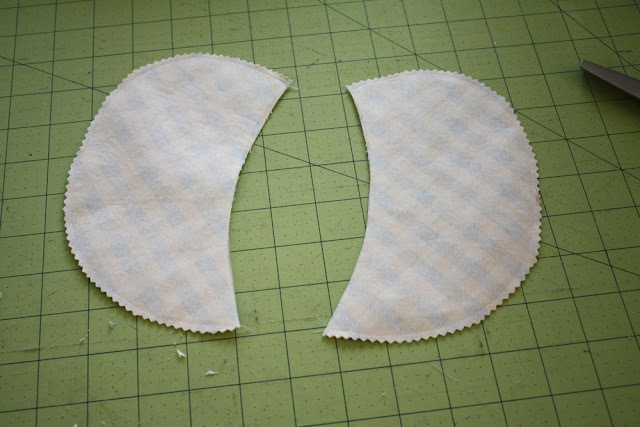 Use a 1/4″ seam allowance throughout. Then take the ears, and iron on the interfacing to one wrong side of one piece. 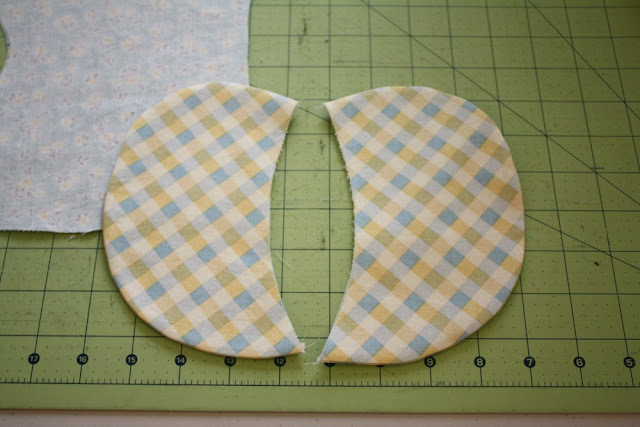 Sew the two ear pieces right sides together around the outside of the ear. Leave the inside curve open. Repeat for other ear. Then clip the curves (or use pinking shears-so quick and does the hard work for you! ), and turn right side out. 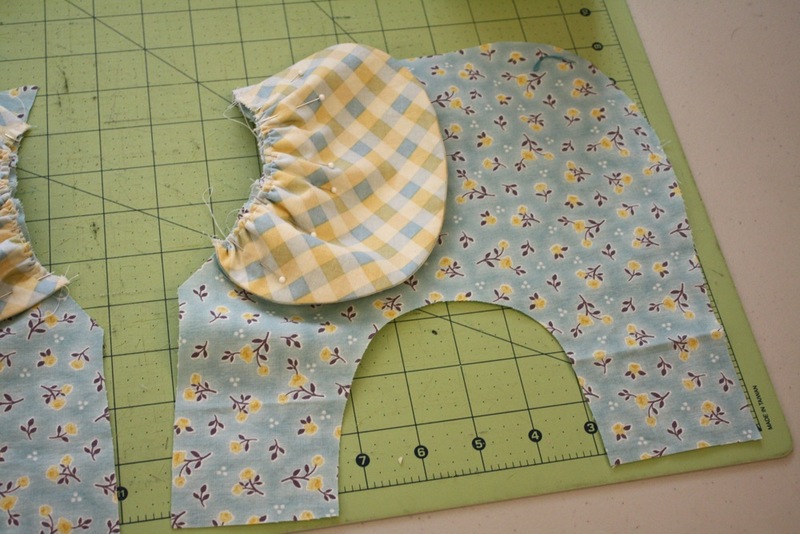 Then sew a gathering stitch along the open side, and gather the ears. You can gather them in more or less, whatever you want! 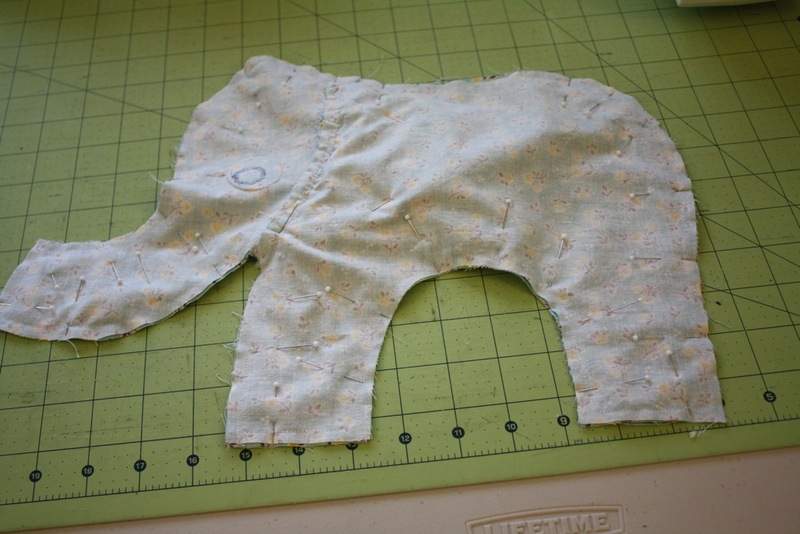 Pin them to the curve of the elephant body like so..then baste the ear along the gathering stitch you sewed earlier. Repeat for other ear. Then take the elephant head piece and pin on top of the ear. You’ll have to manipulate it a little to get it pinned but it will fit nicely. 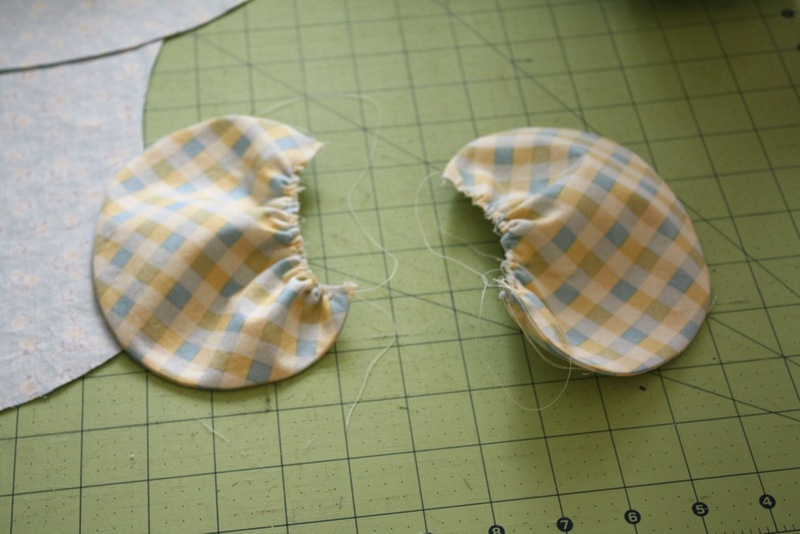 Then sew those pieces together. Lightly press. repeat with other side of elephant. Add the blue for the eyes and sew it down the same as the white. 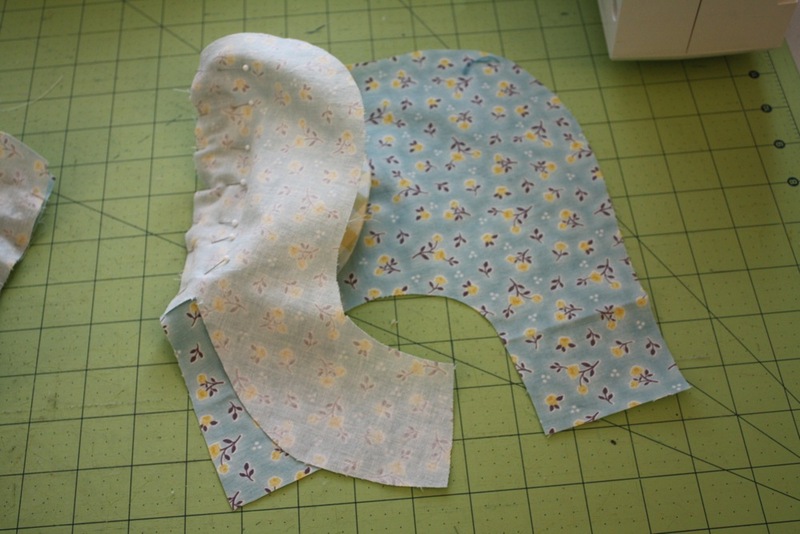 Then fold down the ear and pin so it won’t get caught in the seam. Do the same for the lower ear-I just took a picture before I did! Grab a 3-4″ piece of ribbon and tie a little knot in the end. Heat seal the edge with a lighter or fray check, and place it where you’d like it. Then pin the two sides of the elephant together like so. 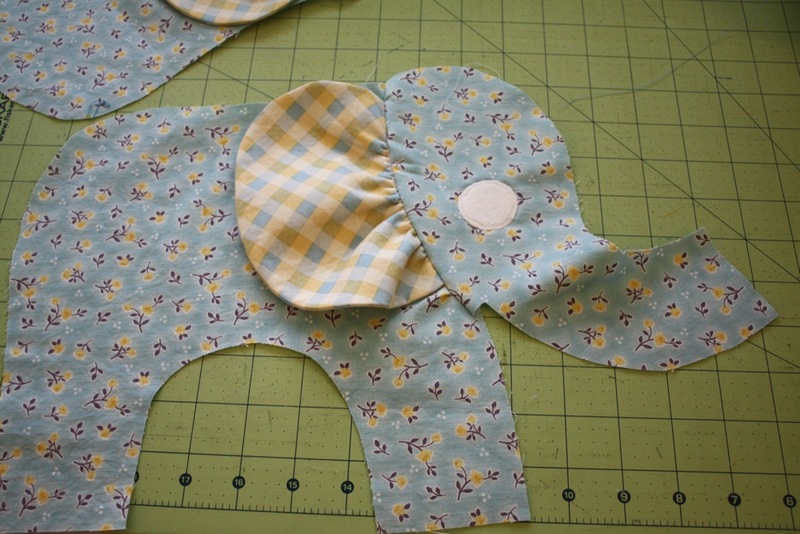 Sew around the entire elephant, starting at the back and ending right after the neck, leaving about a 3″ opening. Clip corners and curves-not too close to the seam! Turn right side out and stuff with poly fil. Sew the opening close with an invisible stitch, and you’re done! And thanks for this tutorial. I am pregnant and just found out yesterday that it is a girl. I can’t wait to make her one of these! HAPPY HAPPY BIRTHDAY!!! The elephants are adorable! What did the elephant wish for on his birthday? A trunkful of presents! Lol – corny, I know. Hope you are having a fantastic day! And congrats on being at Riley Blake! Bonne fête!!! Reading from Quebec city, Canada… I really enjoy your blog, thanks for everything.. So cute Jess. And Happy Birthday! You’ve had a birthday, shout HOORAY! Hope it was a GREAT day, and that you did something just for you, and maybe out of the ordinary. How many times can I say adorable? These really are Jess! You are really good at this! And those elephants are SO CUTE!! I just love this elephant softie. I think this might be the cutest softie I have seen. I am going to a baby shower in 2 weeks and you are motivating me to make this!! As always, thanks for the inspiration (and easy to follow tutorial). Those elephants are waaaay too cute! Wonder if I could whip one up before we leave tomorrow to visit my newest nephew and family for Thanksgiving?? Hmm…probably don’t need to add that to my to-do list, but they are adorable! happy birthday! so cute as always!! HAPPY HAPPY Birthday!!! I hope your day is fantastic! GAH! I was looking for an elephant tutorial leading up to my baby shower. I never did make one, and it is a good thing too because of the whole gender switch thing- now I can do a girl one! Thanks Jess! Ahhhh soooo cute!!!! Evelyn needs one of these! I have so many projects I want to tackle and I will just add this one to the list!! Love them! So cute!! Checked out and bookmarked 🙂 Thanks! so sorry my impatience meant it posted that comment 3 times! delete away! 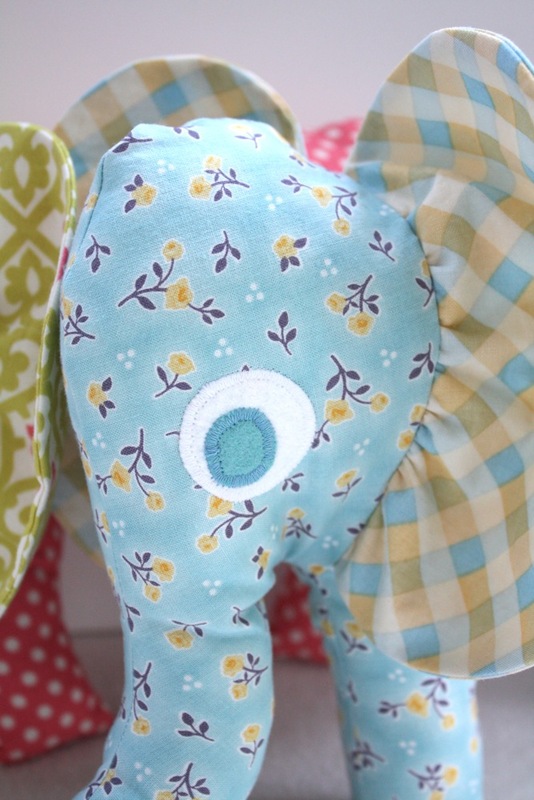 I just saw your adorable elephant tute on the Riley Blake blog and had to come say thank you. It is the most adorable elephant. 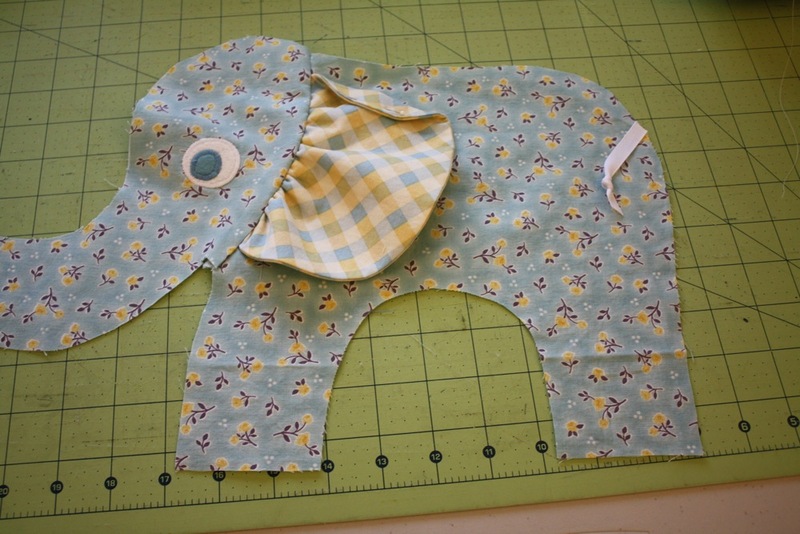 I’m going to try and find time to make one for my 4 yr old Granddaughter for Christmas. And it’s a bit late but, Happy Birthday! I hope it was an awesome day for you. Thank you for the adorable elephant tutorial. I will need to try these out as gifts for some little people I know! happy happy birthday, jess! i hope it was exciting, fun, and relaxing all at once. Happiest of Birthday wishes! 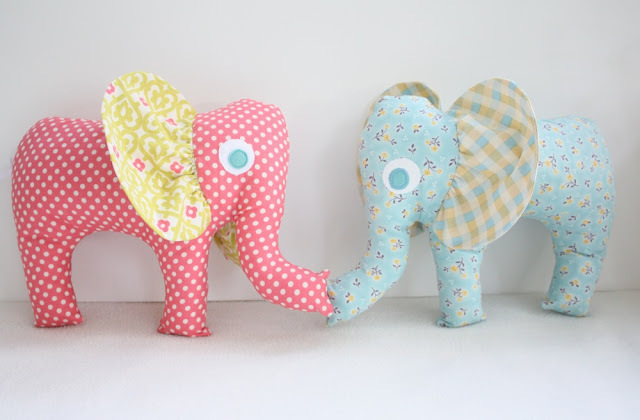 Love the elephants, too cute! These are adorable. I couldn’t get the guest post to open for the pattern…Do you have another link to the pattern? I would love to make these for my kiddos! I forgot to give you my contact info for the pattern. My email is [email protected]. Thanks! Would it be possible to get a copy of the tutorial reposted as it’s not available on Riley Blake. Great tutorial! The little elephant turned out great!!! Sooooooooo cute… 🙂 Thanks so much! Many blessings! These are ADORABLE! And I’m in the process of making 2! 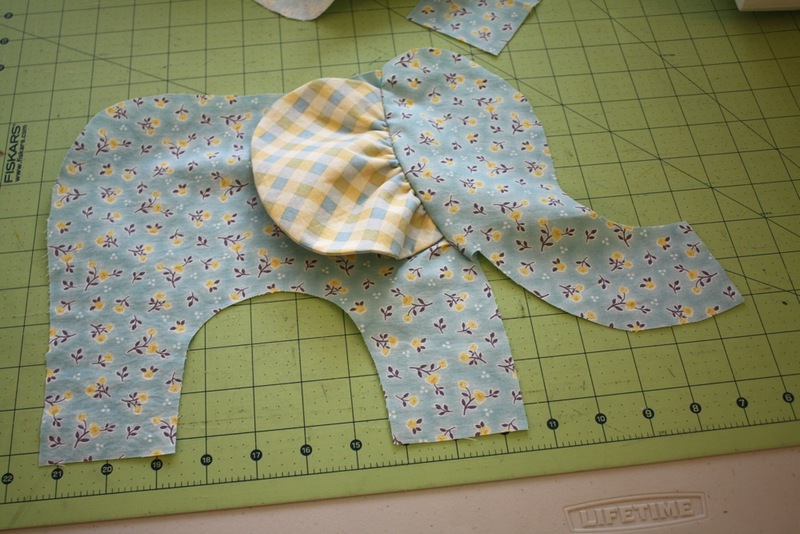 I was hoping you could help me figure out how to add something underneath the elephants, so that they have 4 legs?! I’m not certain how to get it to look right. Thanks and I look forward to hearing from you! I made one of these for my great nephew. Thank you so much for sharing the pattern! Hi! 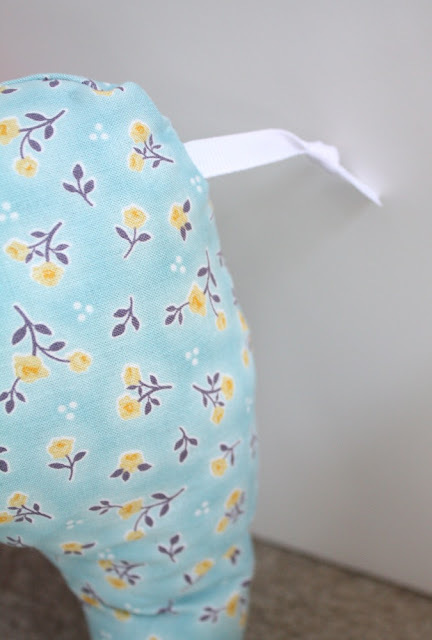 i love this tutorial i make these for baby shower gifts. everyone loves them! :) thanks keep up the good work! Thank you so much! I made this for a baby welcome home/happy birthday gift. I am so excited for her to be born so I can give this to her. Thank you soooo much very this adorable tutorial. I have printed the pattern immediately and tomorrow I will sew them. As I promised myself to make the elephant today, I did. But now I realize that he has only 2 legs!!! Do you know how I can make another one with 4 legs please? Now I see others posts with the same question and your answer. So I go on for looking a pattern on Pinterest.